***DISCLAIMER*** The following review is entirely my opinion. If you comment (which I encourage you to do) be respectful. If you don't agree with my opinion (or other commenters), that's fine. To each their own. These reviews are not meant to be statements of facts or endorsements, I am just sharing my opinions and my perspective when watching the film and is not meant to reflect how these films should be viewed. Finally, the reviews are given on a scale of 0-5. 0, of course, being unwatchable. 1, being terrible. 2, being not great. 3, being okay. 4, being great and 5, being epic! And if you enjoy these reviews feel free to share them and follow the blog or follow me on Twitter (@RevRonster) for links to my reviews and the occasional live-Tweet session of the movie I'm watching! Lions and tigers and Brigsby Bears, oh my! Recently I watched a film from a former SNL cast member and I found it to be a very underwhelming experience, despite the fact the writer/director/star said that it was the most amazing thing to ever be created during his promotional tour. He also shat on his big star during this and insinuated that he’s not a draw—despite the fact the star will live on in infamy and this creator will be remembered as having some okay bits on Saturday Night Live (if remembered at all). Right after I watched that, I viewed another film from an SNL cast member and started to think about his small promotional tour he did and how he spoke of the movie. I remember him being very modest about it and sorta downplayed it. Basically, he was humble about his feature. 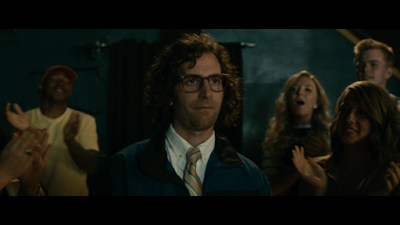 The star was Kyle Mooney and the film was Brigsby Bear and, not surprisingly, the film that he spoke so softly about ended up being something very charming and moving; unlike the star who spoke loudly about his movie and that one ended up being kind of a piece of junk. There's murder in that there bear's eyes. James (Mooney) has known the world only one way as he lives underground in a bunker with his parents; Ted and April Mitchum (Mark Hamill and Jane Adams). 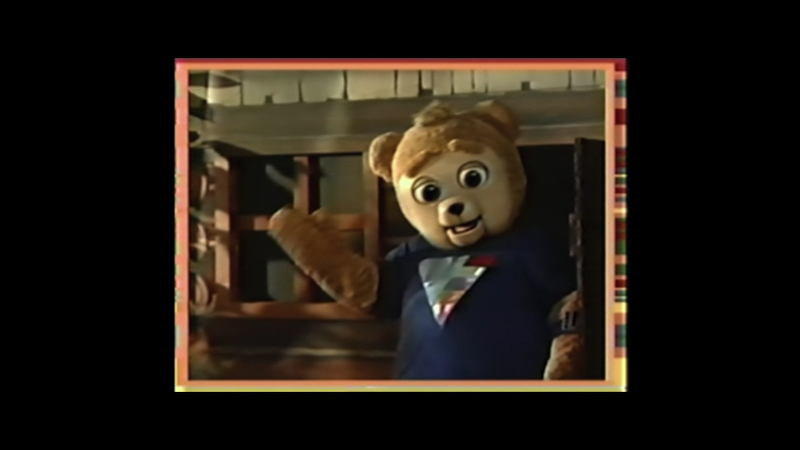 While hidden, he spends his days watching an educational children’s show called Brigsby Bear Adventures, an odd series about an anthropomorphized bear that has adventures in space and teaches lessons along the way. One day, after a raid from the authorities, James learns that Ted and April aren’t his parents and that the world isn’t a deadly wasteland; he was just kidnapped as a child by the two and raised in seclusion. After meeting his real family and having to see the world for the first time, James soon learns that his beloved show was just a creation of the man he once knew as his father. Adjusting proves to be difficult but after making a friend in the tech savvy Spencer (Jorge Lendeborg Jr.), James decides he is going to finish the Brigsby Bear Adventures series and make it into a movie. They're remaking Brigsby Bear?!? Great, my childhood behind held hostage is ruined. 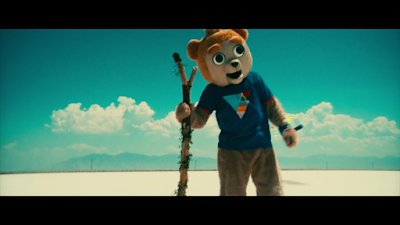 With its premise, it’s hard not to imagine that Brigsby Bear would be a wacky comedy about a dude who doesn’t understand how the world works and is obsessed with a television show that was made solely for him. You’d think there be all these jokes about the guy being scared by unfamiliar technology and not getting slang but the film proved to be so much deeper. The film was actually a very charming, tender and emotional comedy about a man finally seeing how big the world is and then wanted to share the tiny details that defined him and shaped him with everyone around him. Brigsby Bear is far more heartwarming and sweet than it had any right to be and I’m glad it was. Happiness is a thing that doesn't exist there." The premise is a very unique one and writers Mooney and Kevin Costello really make it stand out. Watching James become a fish-out-of-water as his world is turned upside and retreating to what he knows and loves the best for comfort and then use that to connect with this new, confusing world is endlessly captivating. Everything about the story develops and unfolds fantastically so there’s never any slow-down or loss of momentum. Watching the journey of James and those around him never hits any snags or hiccups. The entire story and plot just flows and progresses so well and the characters are so defined that it was easy to be invested with everything I saw. that Hollywood has run out of ideas. Another element that made the feature and the story so engaging is the performances from the cast. The film has a great collection of very talented people making up the supporting players in James’ life. Greg Kinnear plays a detective that is in charge of the case and then becomes sympathetic to his adjustment and mission to make a Brigsby Bear movie. James’ family is played by Matt Walsh and Michaela Watkins as his parents and Ryan Simpkins as his sister and they’re all doing a great job of playing the roles of those who are happy to see their long lost family member return and then become frustrated with his lack of acclimating to his surroundings. 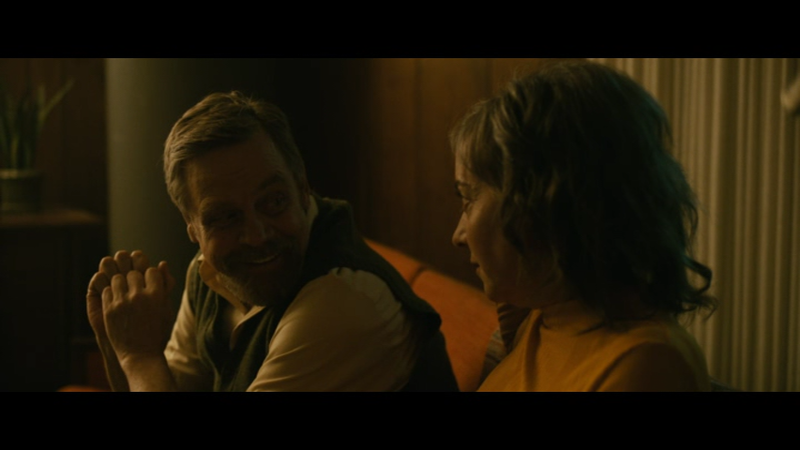 Finally, I really enjoyed Mark Hamill and Jane Adams as the two that try to present themselves as James’ parents. Hamill is a great actor with both live-action and voice work and this film allows him to showcase both. Hamill also has lines and isn't just staring intensely. Ultimately though, the strongest performance is from Mooney himself. Mooney has a history of being a goofy guy thanks to his work on SNL and various comedies and James could have easily been a one-note joke the entire movie but Mooney was able to showcase the humorous side and balance it out with a sympathetic angle. James is clearly confused by what has happened to him and Mooney’s performance is able to capture that confusion and then add to it with a desire to fit in and connect but a reluctance to let go of everything he once knew. Mooney’s performance was astounding and very moving. this film showed me he is far more talented than I ever realized. Brigsby Bear is a terrific dramedy that takes its odd premise and leans away from the easy jokes or possibly absurdist humor and, instead, aims for something more endearing and geared towards the heart. The replay value on this might be a little low for me but with its great cast adding to the story, it still made for a feature that is very strong and memorable.